Below are bed bug images and pictures providing a magnified view at different development stages. 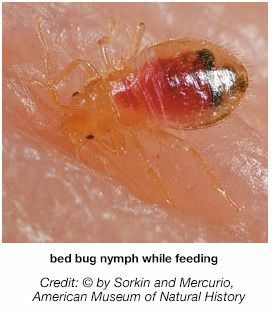 This page is important as identifying a bed bug infestation early on can help reduce the spread and progression of an infestation. 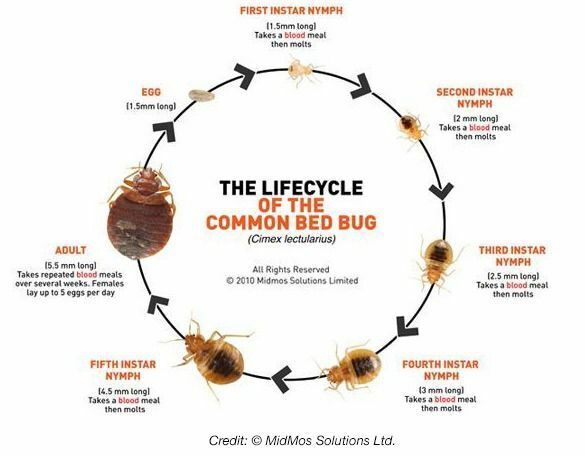 Bed bugs take on many different appearance throughout their 5 stages of development as well as before and after a meal, which can make identification more difficult. We have complied the following images to make such identification much easier. The pictures below show a bed bud during a blood meal as it gradually fills with blood. 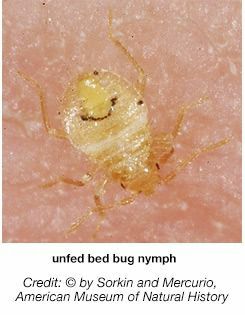 It's quite interesting as the end pictures looks quite different than the stereotypical image we perceive bed bugs to be. As they feed up to 7 times their own weight, their flat body becomes more round (sort of like a wasp). 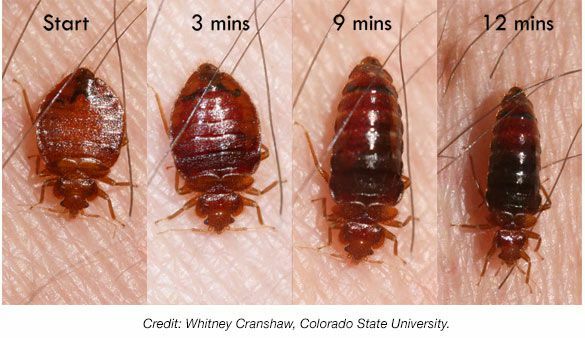 Bed bugs go through 5 stages of development during which their size and appearance dramatically changes from almost translucent to finally a dark brown adult bed bug. 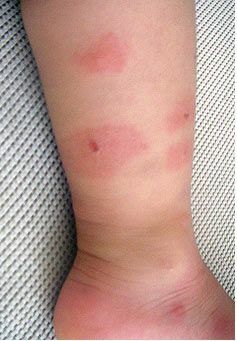 In order to develop and progress through each of the 5 stages, bed bugs must continue to feed. 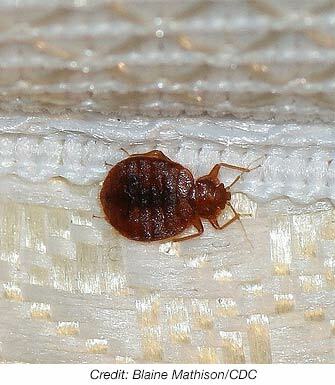 Without a blood meal, they cannot become and adult bed bug where reproduction would then occur. This is why cutting off their ability to feed with climbup interceptors and certified bedding encasements is crucial to a successful treatment. If you think you may have bed bugs, we suggest monitoring for them by applying Climbup Insect Interceptors. Place the traps under the feet of your bed or other furniture, and the bugs will fall into them and get trapped. 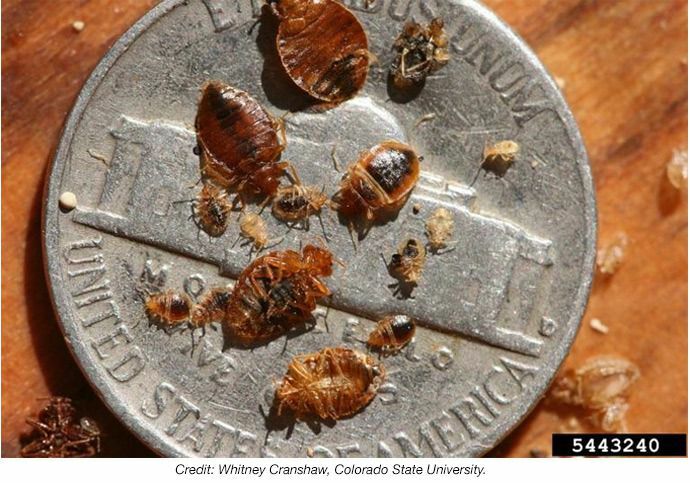 Below is a picture of bed bugs at different life stages on top of a nickel. Adult bed bugs end up about half the size of an apple seed with earlier stages being a fraction of the size. Given unfed 1st instar nymphs are almost translucent in appearance, it can be difficult to see them. 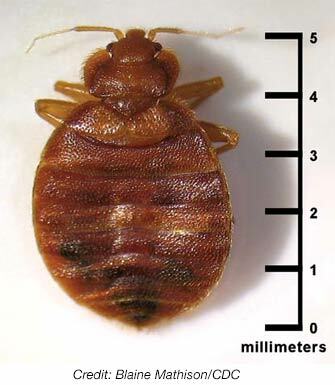 Bed bugs must feed in order to develop into an adult bed bug. The following images show a 1st instar nymph before and after a blood meal. Notice how different the bed bugs appearance becomes after feeding from almost transparent to blood red.